The most popular room in our house is the screen porch, despite its small and somewhat awkward size. Even on cold winter days, if the sun is out, we’re out on the porch. It happens to be south facing and the acrylic panels trap the sun’s heat wonderfully. Often times it is warmer than our heated house. This room also has the wonderful benefit of having floor to ceiling views on three of the four walls. As my young children scramble around the porch I often daydream of piddling around in the yard. Thinking to myself of what garden chores need to be done, what bed lines need improving and if I’m feeling particularly wistful….what new fun plant additions! While in mid landscape design dream land, five deer jumped a 3’ chain-link fence (something I also vision creatively disguising) into the yard. And by jump, I mean gracefully stepped over. 3’ was not a problem for these young’ns. As we watched these deer search for something edible in our winter garden I immediately became tense. Having seen loads of evidence of their presence here before, this was the first time we had witnessed them helping themselves to whatever our yard had to offer. Needless to say, hungry deer don’t mess around. It seems like they actually enjoy experimenting and trying new foods…something I can’t get my own son to do! Gobbling up hostas is one thing, but thorny raspberries – even new growth on my climbing rose- it’s too much. 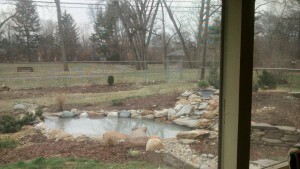 In school, we actually had a whole segment designated to animal control in the landscape. There are a slew of books available in the library based solely on this issue. With the academic understanding that deer control has been a problem for a long time, but now the added personal experience and deep annoyance, it’s time for serious decisions and action. What I’ve gleaned so far is that deer are rather smart. You basically have to constantly be changing up your game – one step ahead. A single strategy may work, but only for a matter of time until they figure out your trick. Okay, getting to the point. As my children and I watched, one of the more curious deer sniff the ice on our small pond and then venture out onto it and began to slip and slide across the frozen ice only to desperately scamper off – don’t worry, it wasn’t hurt, but totally hilarious. It all came together. What if the fence was a green fence…more theory than boards? 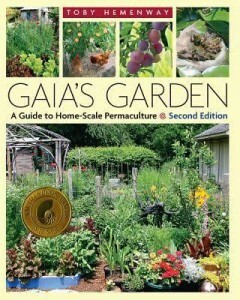 Gaia’s Garden: A guide to Home-Scale Permaculture, by Toby Hemenway, was recent winter reading recommended by local gardening professional, Debra Knapke’s blog Heartland Gardening. 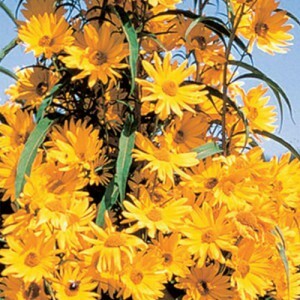 Hemenway mention in a sidebar using Maximillian sunflower, Helianthus maximilianii, to deter deer. It’s a perennial sunflower that grows to about 5’ tall. It grows just dense enough that the deer don’t want to walk through it, let alone nibble at it. Toby Hemenway describes how he designed a Maximillian sunflower swath slightly downhill from their perennial cut garden and that was successful in keeping deer out of that area. And even though it’s a perennial, supposedly the stalks of the sunflower are thick enough to cut down to 4’ and stay up over winter, deterring for four seasons! As an added benefit, Maximillian sunflowers attract bees and other (small) beneficial wild life to the garden. The flowers are 4” across and a bright happy yellow. It should to be noted that this is design idea more suited for the less formal gardens, somewhat naturalized areas, or a good border between a naturalized and more intentional areas. Our backyard is surrounded by a chain-link fence. The back stretch is 5’ tall while the sides are only 3’ in height. I’m going to plant Maximillian perennial sunflower this spring from seed along the 3’ tall chain- link sides. There are two appealing outcomes rolling around in my head. The first being that these magical sunflowers really do deter the deer from entering my yard if planted strategically. Secondly, perhaps we’ll see deer jump the 5’ stretch of fence! I’ll let you know how this project pans out, both functionally and aesthetically. Happy gardening! This entry was posted in Gardening, Landscape, perennials, permaculture, pest control and tagged books, deer, gardening, landscape, perennials. Bookmark the permalink.